The founding document of the American republic came as no surprise to the patriots of New England. A few weeks later on July 4, in Philadelphia, American leaders signed a Declaration of Independence from Great Britain. Though many of the most important battles of the Revolutionary War were later to be fought in New York and Pennsylvania, New England prides itself on having been the place where it all began. Patriots' Day(April 19) is a holiday in Massachusetts, and hundreds of citizens and visitors turn out at dawn to witness reenactments of the battles of Lexington and Concord staged by groups in period uniforms. 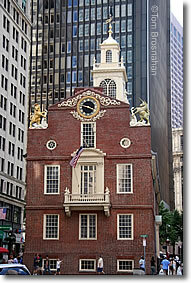 The Old State House, Boston MA. The Declaration of Independence was read to the public from its second-floor balcony.